I was watching the news this morning and saw the Today Show did a story about a woman in NYC who taped herself walking throughout the city and documenting how many times she got cat called by men. Now, this wasn’t shocking or earth shattering news, however, it’s quite interesting to think about this on a broader scale. If you think about it, people feel entitled and inclined to do and say whatever the hell they want. OK, so we know that freedom of speech is your first amendment right, and within reason, pending you abide by the law you can do what you want as well. But is there a line drawn for that or rather, should there be? In the story with the woman in NYC, there was a man that literally walked right next to her for at least 5 minutes and didn’t say a word. He just creepily followed her and walked right next to her. A bit much? I’d say so. Shouldn’t a line be drawn when it comes to personal space and respect? Is it a cultural thing? Perhaps it’s just a person being oblivious. I don’t really know. 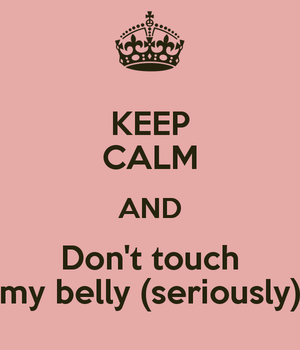 What I do know is that one of my wife’s biggest complaints throughout her pregnancy was people feeling entitled or inclined to touch her belly at their leisure. My wife is a very private person and isn’t into the whole touchy feely thing in general, let alone perfect strangers touching her, so this proved to be quite challenging for her. Don’t get me wrong, my wife was a REALLY good sport when it came to friends and family wanting to touch her belly and feel the baby but again, there has to be a line drawn on this. I recall my wife telling me about one of her work colleagues that is just that, a work colleague, nothing more, who literally walked right up to her, didn’t say a word, and literally just started fondling her belly. She described it as one of the most uncomfortable and awkward experiences ever, and I can imagine why. Would you walk up to a stranger and just start rubbing their belly if they weren’t pregnant? Nope, I doubt it, unless you were a sadist and wanted to get punched in the face. It’s just not proper “people” etiquette to walk around rubbing people’s stomachs and a woman who is pregnant is no exception to the rule as far as I’m concerned. If you really must, I suppose asking for permission is acceptable but that also puts the mom to be in a pretty awkward position as well. 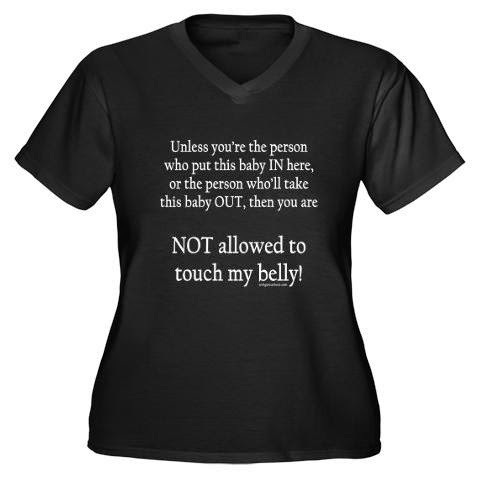 What’s she supposed to say upon your request, “No, you may not touch my belly” and risk sounding like a hormonal bizatch? Ok, well chances are she is hormonal but not necessarily a bizatch and reserves the right to not have her pregnant belly accosted. So, I leave you with this, before you nuzzle up to a pregnant woman’s belly, unless she is your partner, think twice. You wouldn’t like it and they don’t either. Coconut Oil on your labia…say what? !